Springtime usually brings chirping birds and warm fragrant air with it, but for many unlucky property owners, this time of year brings swarming termites, too. Just like other members of the animal family, nature calls termites to mate. Some animals are happy to stay where they’re at and simply rear their young in a comfortable place they’ve occupied for a long time; termites, though, are different. These destructive insects swarm out of a need to expand their territory. Once a termite colony achieves maturity, aletes begin to grow. These aletes are in a caste by themselves. Unlike workers and soldiers, their lives are all about mating and expanding the termite gene pool. Once they grow to maturity and develop wings, they wait for outside conditions to be right, then they swarm out in search of a new place to call home. The originating colony must be mature. This typically takes between 3 to 4 years to occur. Termite aletes must be fully mature and ready to leave the colony. Outside conditions must be ideal. Most termites like to swarm on warm, humid evenings, though this is not a hard and fast rule. 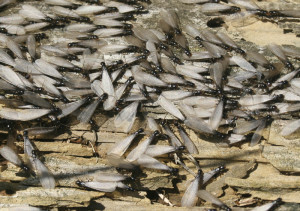 As long as it’s warm enough for flight to occur, swarming termites may leave their originating colony. What Does it Mean if You See Swarming Termites? If you see swarming termites, there’s definitely a potential problem. First, if you see swarming termites leaving your home, it’s a certain sign that there is a mature colony inside, chewing away at inner structures and potentially causing significant damage. If this is the case, it’s vital that you inspect your home immediately, determine the extent of damage, and then create a plan for combating the colony inside. Second, if you see swarming termites approaching your home, it’s a sign that these invasive insects are eyeing up your property as a potential nesting site. Your best line of defense is to be prepared before you notice the termites; keep firewood, mulch, and other food sources away from foundations, and ensure cracks and other entry points are sealed as soon as you notice them. Termite control is not difficult so long as it’s based on prevention. Learn more with our useful guide to controlling termites. With the right measures in place, you may never need to call an exterminator.